Is calculator allowed in cut-e test (1A) ? Good day mates! I have applied for the program last year and after a month or two, Cathay invited me for the initial step or 1a as they call it. Unfortunately, I didn’t get in because I was underprepared. It was my term in uni when I got the invite and I was studying for my finals. I updated my application and still waiting for their reply...and it has been a year and a half. Can anyone add me to their facebook / telegram / viber study/discussion groups where I could ask study materials from. My username is Hans Eco. Anybody in Los Angeles thinking about applying? Also side question, how much do SO get paid during their first year after the cadet program (assuming in 2019)? From the employee handbook effective Dec 2018 (posted above by flyera359), for an SO, basic pay should be at 31,383.33, with monthly productivity pay at 611.36 (B777), 640.48 (Airbus), 742.07 (B747) beyond minimum monthly block hours ([email protected], [email protected], [email protected]). There are also some allowances, most of which, I think, would be negligible except the "monthly allowance" (maybe meant for housing?) at 14,000. You could read up on it to get a clearer picture. Hope this helps! What's the pay like for SO under the COS08 contracts? Also realistically, how many days do pilots fly in a month(max vs min)? And how many days do they usually get off? We are finding our stage2 groupmate on22Nov. please let me know if you are on of us. 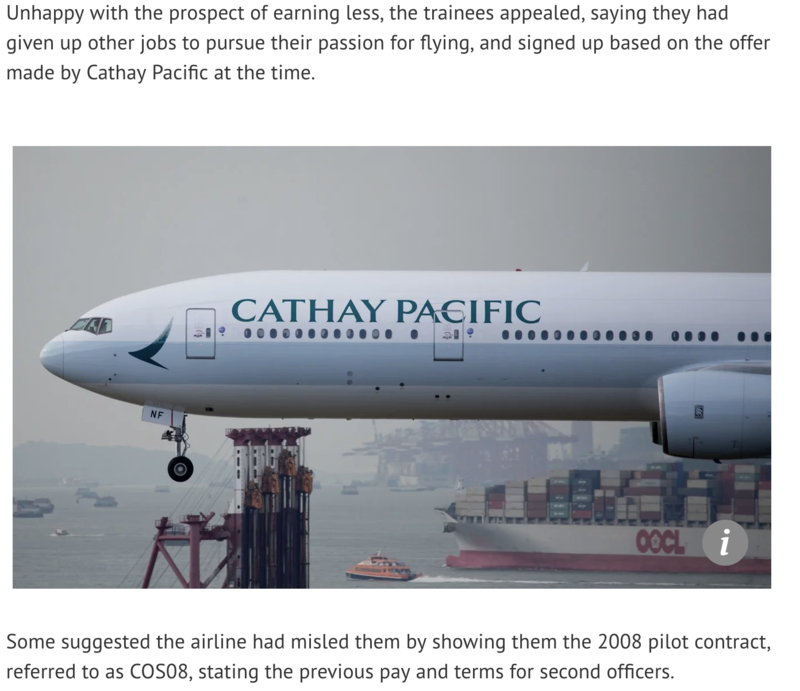 SO pay for COS08 contracts starts at $40,747 HKD a month. Add to that your 10,000 for HKPA, your 10% for duty hours (around 5000 extra) plus any overtime allowances is. (keep in mind COS18 does not pay overtime, but rather a set amount after a certain number of productivity limit hours). To put it simply, if you manage 110 hours on COS08, you will receive a double paycheck. If you do the same on COS18, you will not. The contract above will show you the pay on COS18. Also do not count the provident fund pay (which they have included as part of the package). You won't be able to touch this money for many years. 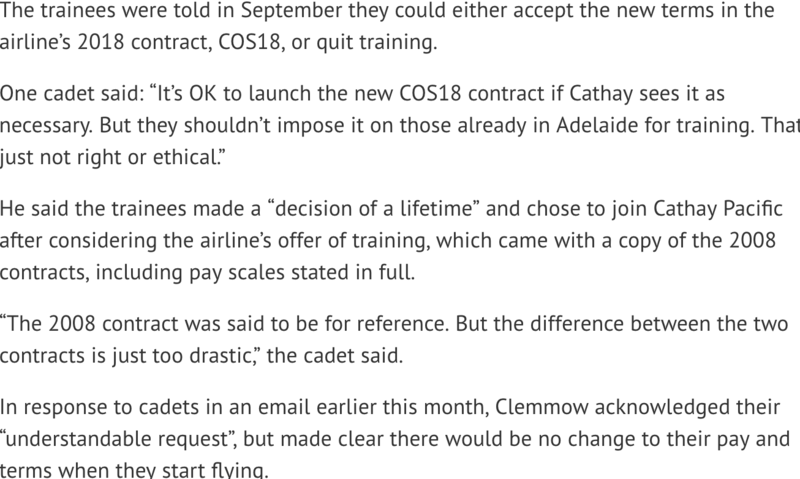 Do also note that COS18 SO's will be docked around 16,000/mo for their training costs over a period of 3 years. Hope this answers your questions. Hi, thanks for the info, but could anyone further explains this? No PA for the first 3 years or for the entire career? For the first 3 years only cause this 16,000/mo is paying for your cadet training. After 3 years, you will receive the PA again. Thinking about applying for the next intake. Does anyone know the duration of the "forgivable loan", knowing new cadets won't get housing allowance for the first three years?? Are you guys still meeting?